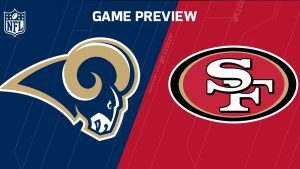 The last game of the NFL’s opening week will be between the now again LA Rams and the San Francisco 49ers. The game will be played at Levi Stadium starting at 10:20 PM ET, ESPN will be covering the game. As I mentioned the Rams are starting a new chapter in the franchise by returning to their original home, Los Angeles, they hope the move will translate into a better season than last, although they weren’t the worst team by far. It looks like the Rams’ starting quarterback will be Case Keenum who has 15 career touchdown passes and 9 interceptions, but the other candidate for the position was rookie Jared Goff, I guess a little experience beats no experience at all. So it seems the LA team is in a difficult spot when it comes to quarterbacks but they make up for it in other offensive areas; they have star running back Todd Gurley who rushed for 1,100 yards and a total of 10 touchdowns after coming off the disabled list from a ACL injury last season, and they also have some good receivers like Tavon Austin and Kenny Britt. Defensively, they have Aaron Donald, Robert Quinn and Trumaine Johnson which should make things very exciting for the team. As for the 49ers, they had another terrible season last year finishing at 5-11, so things can’t go much worse for them, at least that is what their fans are hoping for; but the regular season has started and the team is still in some disarray. They are still undecided on who will be their starting quarterback, the choices are between Blaine Gabbert or Colin Kaepernick. Honestly their offense is so weak I doubt the choice of QB will make any real difference in the long run, I support Kaepernick just because I like him as a human being. To make matters worse for the San Francisco team, their running back Carlos Hyde suffered a concussion and is now questionable for Monday night’s game. At this point the only thing that seems to be in favor of the 49ers is the fact that they are playing at home. Personally I feel the line on the Rams is incorrect, as it should be much higher, I for one will take advantage of this and put my hard earned money on the Rams, which is a purely financial decision because I have never liked the franchise, but I just can’t pass the opportunity to make some easy money. For more pro football online betting options on this game and the rest of the NFL scheduled games for week 1 visit www.AceSportsbook.com.